A simple description for our main properties is listed below. Not all of them are listed as we do not regularly hunt them all. More pictures are available, please contact me and I can provide you with a link to view them. Terrain on the ranch is typically flat with several large dry creek beds (Arroyos) that turn into raging rivers after a good rain. There is a good road system on each ranch where a car can navigate almost the entire property making it easy for anyone to hunt the ranch. High Mountains surround the Shelley ranch in all directions offering wonderful views in the morning and evening hours. The ranch supports a healthy population of Elk, Mule Deer , plenty of Javelina, and a growing Quail population. Minimal hunting pressure exists on the ranch and a strict number of hunts will only be offered each year. Parties interested in Wildlife and Photography Tours or just a weekend get away with the family are more than welcome to contact me for a package set up. The Lodge is available to rent per bedroom if not hunting. There will also be a long range shooting range set up in the near future. Besides the cultivated fields there are multiple free choice protein feeders located throughout the ranch that the Mule deer, Elk and Javelina frequent. Mule deer in the 150" to 170" range are what we are after on this ranch (possibly larger) and the deer herd is slowly rising thanks to heavy feeding and predator control . Mule deer over 180" have been harvested on this property. There are bull elk of all sizes that roam the ranch but an average bull elk is in the 290" to 320" range. Elk and Mule deer can be seen grazing in the fields or watering at one of the many water holes almost every evening making this a great ranch for wildlife photography. The Shelley ranch is located less than 2 hours from El Paso and hunters can fly into El Paso where we can provide transportation for a small fee or meet us out at the ranch. It is very easy to get to. Most hunts will be conducted 2x1 except for Elk, 1x1 hunts are available for an additional fee. Archery hunters are welcome. Specific hunt dates are available for mule deer each year. Hunting over the fields and water sources early morning and evenings and driving the desert country during the day will primarily be the main style of hunting on this ranch. Self guided hunts will be available for Quail and Javelina by request only. All Other hunts will be Guided or Semi Guided. Combined with an excellent food source(s), plenty of water, cover, and minimal hunting pressure this ranch is a great choice for your next hunt. Shelley Ranch Photos Click Here! The 4D (South) ranch is located in far southern Presidio county (aprox. 6,000 acres) and bordered by Big Bend State Park with the town of Redford nearby and old Mexico just to the south. We are now offering hunts on its sister ranch the 4D North which is located at the northern tip of Presidio county. Both of these ranches are similar in terrain and offer good hunting for Trophy Aoudad, Javelina, Quail, and Predators. The 4D North property is nearly identical to the 4D South but larger 15,500 acres. There is a decent road system throughout the ranch(North) and we can accommodate most hunters if they are able to shoot longer distances. Roads can be considered "rough" by most. The 4D North offers a good population of Trophy Free Ranging Aoudad, Javelina, Quail, a growing population of Hogs and Predators. The same goes for the 4D south just no Hogs. There will be no hunting on the 4D North for Mule Deer for several years until our management goals have been met. The 4D South is available to season lease for Mule Deer and although deer numbers are low on average (for this entire region) quality is high being that is is bordered by the state park and a large ranch to the west. Only a handful of hunters will be allowed to hunt the ranch and only mature deer may be taken. 4D North Lodging- there is an older ranch house onsite that we will use as our camp. 3 rooms that will sleep up to 12 people comfortably and 2 bathrooms. It is not fancy by any means but is clean and dry. Water is non potable due to a shallow well. The ranch is located half way between Van Horn Texas and Valentine Texas near the famous 96Ranch and Coal Mine Ranch about a 3 hour drive from El Paso International airport. Yes it is remote and secluded. Hunters can meet us in Van Horn, fly into El Paso and rent a vehicle, or we can provide transportation for a small fee. The 4D South is located 30 minutes east of Presidio toward Lajitas Resort, there is no lodging or amenities onsite so hunters need to be ready to primitive camp or stay in town. Terrain varies from high desert hills, wide open valleys, vacant fields, and medium to large rough rugged near vertical mountains with a lot of rim rock and cliff faces. Be ready for long distance glassing and some tough hikes. Both ranches border some of the most rugged and remote country in Old Mexico where there is no hunting allowed there meaning minimal pressure. Yes we are close to the border and as of today we have had no incidents on either ranch. We will offer guided, semi guided, and a few self guided hunts with assistance on these ranches to ensure strict game management and trophy quality. Several free choice feed areas and watering sites are located on both properties. 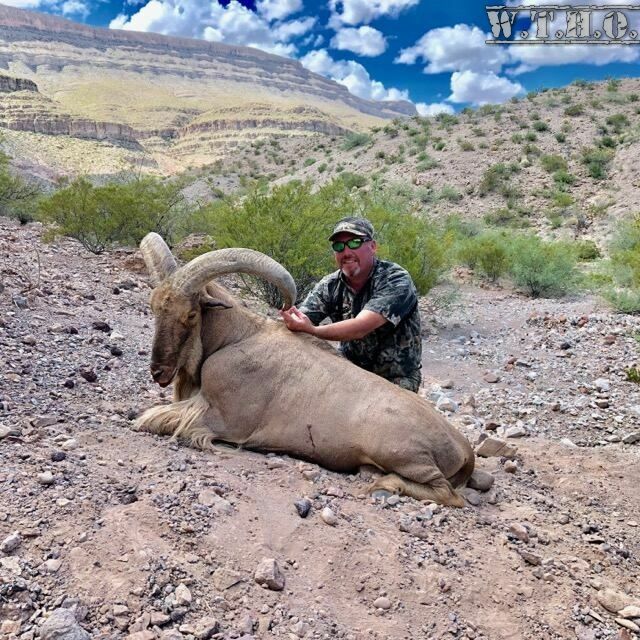 An Aoudad Ram in the 29" to 32" range can usually be expected on your hunt and a Mule Deer Buck in the 140"-160" Range, possibly larger. We have regularly harvested rams up to 35" on both the 4D North and South properties. The 4D South is some of the most scenic terrain in west Texas and I highly recommend planning to stay an extra day after your trip to visit the state park and surrounding attractions. 4D North, South, & Indio Photos- Click Here!